Metal recycling has become an increasingly important factor in environmental as well as economic outcomes. After all, metal is a finite resource. Society lessens the demand for natural resources through recycling. In doing so, we are able to meet our goals of cost reduction. We can effectively manage limited resources, and reduce landfill utilization. In the process of conserving natural resources, we also save the environment by reducing greenhouse gas emissions and energy consumption. North American countries have gained prominence in the global recycled metal market in the last few years due to the region’s expanding electrical and electronics sector. With an increasing demand for consumer electronics, the region’s scrap metal industry is expected to see massive growth in the coming years. On the other hand, it may not be as fast as the growth in developing countries. 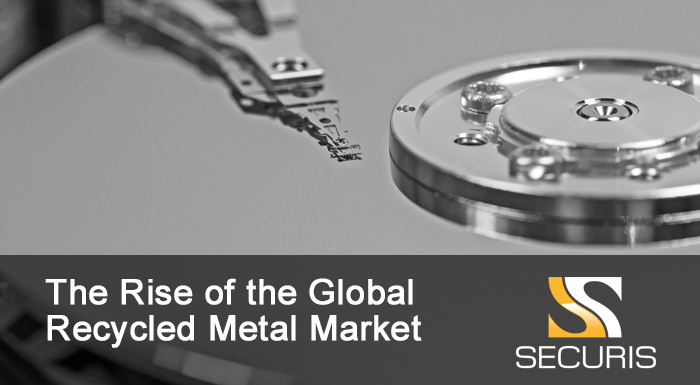 Let’s take a look at the factors driving the growth of the global reprocessed metal market. The rise of the North American recycled metal industry can be attributed to the increasing number of E&E companies that have been working proactively to help reduce the problem of e-waste. Just recently, an aluminum recycling company called Novelis acquired Aleris, one of the region’s leading manufacturer of recycled aluminum products. You might know them for supplying products to aerospace, defense, automotive, construction and packaging industries. Back in 2016, they used up about 734,000 metric tons of recycled aluminum to create their products. For Novelis, the acquisition is expected to be beneficial. They get to expand their business and obtain Aleris’s large consumer base. As consumers become more conscious of their impact on the environment, you can anticipate an increase in the demand for metal recycling. In turn, more activities that lead to loss of biodiversity such as mining will be put in a negative light. Due to the growing concern for the environment, regional governments and companies will adopt the necessary practices for recycling metals. For instance, they could set up scrap collection centers where you can hand over gadgets and equipment you no longer use. When more private companies and regulatory boards become aware of the benefits of recycling metals, they get to boost the commercialization scale of this business space. In turn, you may observe the widespread consumption of recycled metal products across various industry verticals such as food and beverage, packaging, aerospace, and construction. Towards the end of 2024, you should see this market amass a revenue of $125 billion. As for developing countries especially in Latin America, the growth of their metal recycling market is predicted to grow faster than North American countries. Favorable conditions in Brazil, Mexico, Argentina, and Valenzuela in terms of attracting capital investment projects will drive this massive growth. Rapid industrialization and urbanization are also considered important factors in the growth of the metal recycling market. In countries such as China, India, and Brazil, the rising income and improved spending capacity of consumers are making a significant impact on the market’s growth. Moreover, the increased demand for metal recycling across various industries such as automotive, medical and healthcare contribute to this robust development. In the Asia Pacific and the Middle Eastern regions, strong urbanization and industrialization will expand their construction industries. As a result, it will influence the demand for reprocessed metal in subsequent years. Much like in North American countries, the growth of the metal recycling market in developing countries will also be driven by private and public sectors. Their adoption and encouragement of sustainable practices will reinforce the need for metal recycling. On the other hand, the government’s restriction on free and fair trade of scrap metals will pose a threat to the market’s growth. The lack of organized waste collection practices is also likely to hamper the growth of this market. As the metal recycling industry continues to find widespread applications for products in end-user industries, you should witness a gradual increase in demand for these products. This solid demand is going to have a significant influence on the overall reprocessed metal market industry size in the next few years. Moreover, increased regulations and policies for the management and disposal of e-waste will impact the market in the years to come. To learn more about how metal recycling can benefit you, please contact us today.